What a groundbreaking design the Samsung PL20 has. 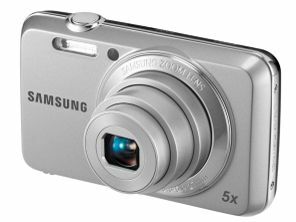 Samsung has announced the Samsung PL20, its latest point-and-shoot camera. There's nothing particularly spectacular about the camera, unless you travel back in time to a couple of years ago when 720p HD video recording was headline news. Alongside HD video, the dinky digital camera also offers a 14MP sensor and 27mm wide-angle lens with 5x optical zoom. The nervous photographer will be pleased to hear that the PL20 has digital image stabilisation (DIS) built-in, as well as rechargeable batteries. Although there's no mention of the screen on the rear of the device, we imagine there is one for fiddling about with Samsung's SmartAuto features, including themes and modes which can be matched to your scene and previewing effects like fish-eye. Available in red, silver, pink and black, the Samsung PL20's UK pricing is set at £99, with the UK release date set to be some time in March.